We welcome your inquiries and questions and will respond within one business day. The calendar is updated frequently. Click the video link to walk through the apartment. Note: for 3 night stays there is an "Administrative Fee" that will be removed for longer stays. Romantic apartment has inspiring views of Florence. Top floor, sunny bright. Located on the Oltrarno side of the river directly across from the Uffizi museum. Fabulous terrace. "We loved our stay at the Torella--it was a magical time in a perfect setting." 1 bedroom with queen sized bed, 1 bathroom, living room, kitchen, large terrace with spectacular views. 463 square feet on two levels with living room, kitchen, bathroom with shower, terrace downstairs. Bedroom upstairs (up one short narrow flight of stairs). 6th floor with elevator. Apartment entrance is up 1 flight of stairs after exiting the elevator. Washer, wifi internet, electric stove, microwave, satellite TV. A/C in living room & bedroom. Building has a doorman. This amazingly sun filled apartment is at the top of a Renaissance palazzo that faces the gallery of the Uffizi gallery, the most famous museum in Florence, across the Arno river. "Torella was a fabulous location, wonderful views of the Arno River and terrifically close to the Ponte Vecchio, Pizzi Palace and other sites." The building blends with its Renaissance-age neighbors with grey stone, pietra serena, accenting its classical proportions. The building is locked and has a doorman during business hours. There are a few steps from the street to the level of the elevator which takes you all the way to the floor below the Torella apartment. The staircase, 18 steps, is beautifully painted and leads past a coat closet to the main level of the apartment. The expansive, private terrace is the highlight of the main level. It faces uphill and from there you can see across the river to Santa Croce, Ponte alle Grazie, San Miniate and Piazzale Michelangelo with its beautiful views. A garden in the summer, the terrace has a table and chairs for dining and enjoying the sun and views. "I loved the terrace. On sunny days I would sit out there working, facing eastward up river." From the terrace, step into a charming room that has a full height window and door on its terrace side. There is a glass-topped table with two chairs, a bench and shelf unit in this room. A pass-through window opens onto the kitchen. Three steps from this dining room leads into the living room with comfortable sofa, chair, credenza with television. The credenza contains the dishes and silver ware as well as the microwave. Alongside the credenza is also the refrigerator-freezer. The kitchen is small, but has everything for preparing meals: two burner electric stove, sink, coffee pot, drip coffee maker, electric tea kettle, pots, pans, knives, utensils. The bathroom has a shower, toilet, bidet, sink and washing machine. It has an independent heating unit. The bedroom is accessed up a narrow staircase that rises from the living room. There are 19 steps that aren`t wide, about 19'. Under the steps is the clothes closet and a small closet that holds the vacuum. If the terrace weren`t enough for views and light, the bedroom may even be more wonderful. A room built on top of the building, the bedroom has an arched window in each wall with a memorable view from each. The bed is a divisible king, that can be organized as separate single beds for traveling friends. If you stay up late, maybe even just enjoying the view, you can close the light-blocking drapes so you don`t have to rise with the sun. "The bedroom is the highlight of the flat. 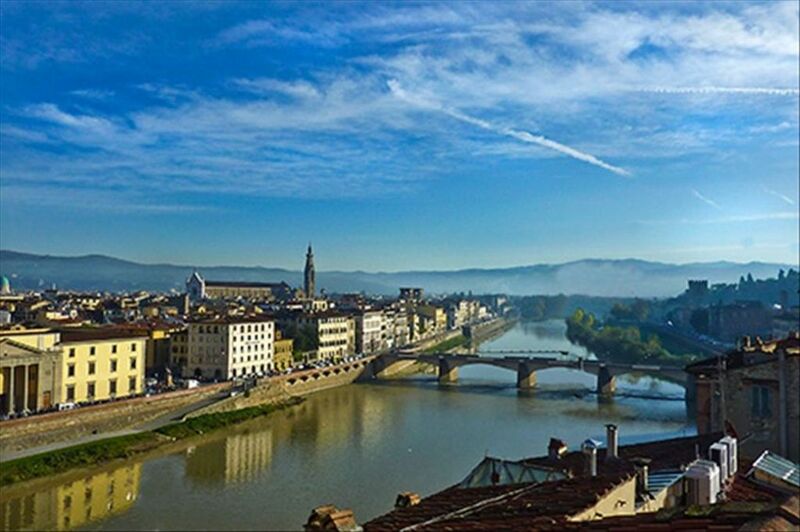 It is the turret on top of the Palazzo with a 360 degree view all over Florence." Guests receive complimentary and helpful documents: 1. FAQ About Renting in Italy, 2. Helpful Information About Florence with our much-appreciated Restaurant list. On request, complimentary children's adventure guide to Italy e-Book. See what the experts say about us! Conde Nast Traveler Magazine Italy Experience Maker award, Travel & Leisure Magazine Italy All-Star award, Better Business Bureau A+ perfect rating, SlowTravel Preferred, Vacation Rental Managers Association professional. This apartment is offered by Italy Perfect. We are a family business with a mission! We want you to love visiting Italy as much as we do. We are sisters Lisa and Pat Byrne who lived in Italy in our youth and now travel there frequently for business and pleasure. We offer only short term rentals that we carefully hand pick for their locations, furnishings, amenities, and that we can personally recommend and would want to stay in ourselves. We travel frequently to inspect, and usually stay in, the rentals we represent. We select vacation rentals that offer charm, good locations, cleanliness, quality furnishings and hospitable welcomes. We count the number of steps up to the property, check the size of the refrigerator, shower, listen for noise, inventory the kitchen equipment and even inspect the mattresses. This is our most important point of differentiation which sets us apart from many other vacation rental firms. Even with careful advance research and personal connections, we still choose to not represent more than 50% of the properties we visit. There is a pay garage nearby. Elevator to one floor below the apartment. A few English language channels.